Making a sequel that significantly improves on a strong original is a feat that few enough filmmakers have ever achieved; asking those filmmakers to try their luck by doing the same thing twice in a row is clearly beyond reason. So it’s hardly a slight against Mad Max Beyond Thunderdome that it fails at the task of being as good or better than Mad Max 2/The Road Warrior. You can count the number of English-language action movies better than The Road Warrior on your hands, with fingers left to spare. It is a singularly high bar that director George Miller and his team set for themselves, and jumping over it, particularly with a project that Miller lost the heart to make even before he started, was never going to happen. 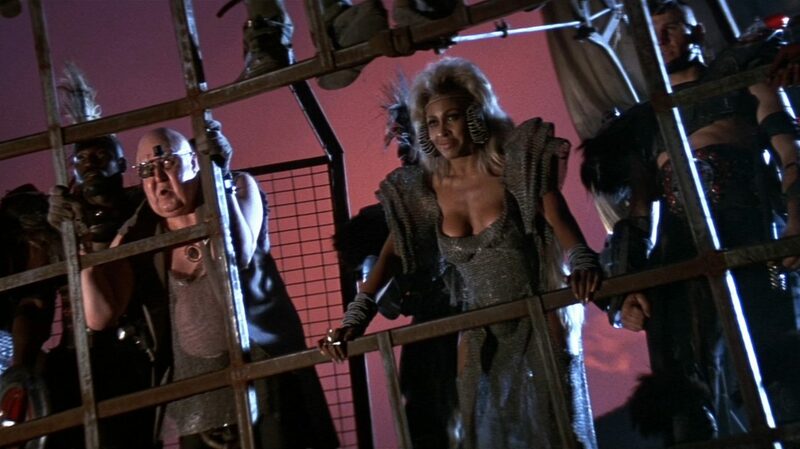 Still and all, it’s hard not to wonder why Beyond Thunderdome isn’t better. It was made by an almost identical creative team to the one behind The Road Warrior: Miller co-wrote the screenplay with Terry Hayes, Dean Semler shot it, Graham “Grace” Walker was the production designer, Norma Moriceau designed the costumes. There were a few big changes: one was Maurice Jarre replacing Brian May to write the score - which is, anyway, a clear trade-up on paper, and largely a trade-up in practice - and another was Richard Francis-Bruce coming on as editor. Miller shifted some of his duties as director to George Ogilvie, who according to the generally accepted account took over all of the story and character moments, while Miller oversaw the action sequences (Miller, in essence, demoted himself to being the second unit director on his own film). And this happened in part because producer Byron Kennedy had died in an accident during the film’s pre-production, leading to Miller’s disengagement from the project, which he completed out of a sense of duty to his colleague’s memory. He has openly confessed since then that he was too depressed about the whole situation to feel terribly invested in the project, and maybe that explains the generally deflated and uninspired feeling that clings to the movie like a shroud. Mad Max and The Road Warrior are tangible passion projects, oozing raw creativity and ambition. Beyond Thunderdome is a thing some people made. The film takes place some undefined while after The Road Warrior and in no way relies on its narrative; it is a pure standalone sequel, using our foreknowledge of the first two films solely so that it doesn’t have to waste time explaining that the continent formerly known as Australia is now a desert wasteland with a crude civilisation that splits the middle between the industrial age on its way down and a neo-medieval feudalism on its way up. Here, we once again meet Max (Mel Gibson, for the third and last time), only identified by name once in the whole feature, looking a bit greyer and more hollowed-out than the last time we saw him, apparently in violation of the promise made by The Road Warrior’s narrator that Max’s experiences in that film led to a restoration of his humanity. To all appearances, Max is still eking out the smallest of existences in the ruins of the world - “to all appearances”, because Beyond Thunderdome does successfully replicate its predecessors’ great strength of refusing to give us any overly clear exposition about anything - and once again he’s on the receiving end of some petty trickery played by a ludicrous madman in a barely functioning flying machine (Bruce Spence, the first actor to return to the franchise in a role almost, but not quite, the same as one he played in a different movie). Following this weird fellow, Max arrives at Bartertown, a relatively stable community, as such things go, which relies on the methane produced by pigs to supply all its energy. This has resulted in a power struggle: Bartertown was founded and has been largely run by Aunty* (Tina Turner), but the methane plant is run by a symbiotic pair called Master Blaster; Master (Angelo Rossitto) is a little man who rides on the back of Blaster (Paul Larsson), a huge hulking brute of a man. Master Blaster has been contesting for ultimate power in Bartertown for quite some time, and while Aunty is perfectly willing to let Max die as a prisoner for the crime of being a stranger, she'll let him go if he challenges her rivals to a fight in the Thunderdome, the metal cage where all of Bartertown's squabbles and feuds are resolved. So far, so great. Or at least, so pretty damn good. Everything in Beyond Thunderdome up to the showdown between Max and Blaster in Thunderdome is, if not quite at the one-of-a-kind level of The Road Warrior, still a fine follow-up that continues to build on the world constructed in that movie, widening its scale and showing a different way that life continues in a warped but still plausible direction. Bartertown is, absolutely, a well-conceived and brilliantly-realised setting, and Ogilvie's exploration of it and the strange characters who live there follows in the series' proud tradition of acting like some very baffling, almost caricatured customs and social orders don't need any kind of explanation at all. Plus, the battle in Thunderdome is a downright miracle and an action scene for the ages, with Max and Blaster on bungee cables being flung around the dome with furious brutality for something deliberately conceived to be the "family-friendly" Mad Max picture; it's a wonderful example of Miller working hard to raise the bar on himself, in what would prove to be his last action film for 30 years. And then Beyond Thunderdome goes beyond Thunderdome, and more or less straight to hell. Max betrays Aunty, and is banished to die in the desert, surviving only because he's found by Savannah Nix (Helen Buday), one of the eldest of a group of children and adolescents living in an oasis. There's a bit more than half of the film's 107-minute running time left at this point (it's comfortably longer than either of its predecessors), and not a whole lot of that remaining time is spent on anything particularly interesting. I do not mind, as many people do, that Max becomes the babysitter to a group that might as well call themselves the Lost Boys (the giveaway is when the refer to "Tomorrow-morrow Land"). But everything about the film turns stupid at this point: Gibson's taciturn Man with No Name performance goes slack and disinterested, Jarre's terrific score collapses into idle nonsense, and Ogilvie's command of tone, so great at making Bartertown seem mysterious and gross and thoroughly real, evaporates, replaced by a halfway-decent facility at getting halfway-decent performance out of child actors. Every now and then, an interesting concept pops up: I'm a great fan of the way that the script shows how the children piece together a comprehensive mythological history by narrating along to disconnected photographs and other images that they've assembled. Mostly, though, the entire second half of Beyond Thunderdome feels like a false start that keeps going on, functioning practically as a totally different second movie that doesn't know what its dramatic stakes are, and fails to convince us that Max has an emotional connection to the children. For that is, on a plot level, what's supposed to be happening: the surly old loner finding his soul by shepherding a group of innocents. In The Road Warrior, with one feral kid, this worked terrifically. Here, with a whole gaggle of them, it feels utterly inauthentic and corny. It's all so much grinding until the far more interesting Bartertown plot can come back to intersect with the lost children, and trigger a massive chase scene that transparently wants to function as the climax of The Road Warrior, only more so. It doesn't get there, at all; the chase that ends The Road Warrior is one of the all-time greats, and Miller used himself up on the Thunderdome fight. If nothing else, it's distinctly shorter, though it includes some truly amazing wide shots - in fact, if there's any way in which Beyond Thunderdome can lay claim to improving on the second film, as opposed to just copying it to somewhat lesser or vastly lesser effect, it's that Semler's work is a bit more obviously textured and layered, with an even more mix of sandy landscape and blue sky, or the cluttered, dusky Bartertown interiors. And so the climax here, with its dramatic half-lighting, looks cooler than the climax of The Road Warrior, though it's not nearly as creative. Still, judging the film as a standalone and not a sequel to one of the all-time genre greats, the last 10 or 15 minutes of Beyond Thunderdome are hard to quibble with. But even as a standalone, there's no defending the 40 minutes preceding that, an inert drama that strangles everything interesting about the movie up to that point. By all means, I enjoy Beyond Thunderdome; it's one of the best fixes a post-apocalypse junkie could ever hope to score. But it's a tremendously frustrating movie in a lot of ways, and even more frustrating a sequel.